Modder Steven Brown went the whole 9 yards on SEC Tecmo Bowl, including creating team helmets. Note 1: Like football games? Check out reviews of Football Frenzy, Tecmo Bowl Japan, Tecmo Super Bowl College, and Tecmo Bowl Arcade! Note 3: If you don’t know anything at all about Tecmo Bowl, I recommend reading the wiki page before reading this review. Quick History: The original Tecmo Bowl was released for the NES in 1989. 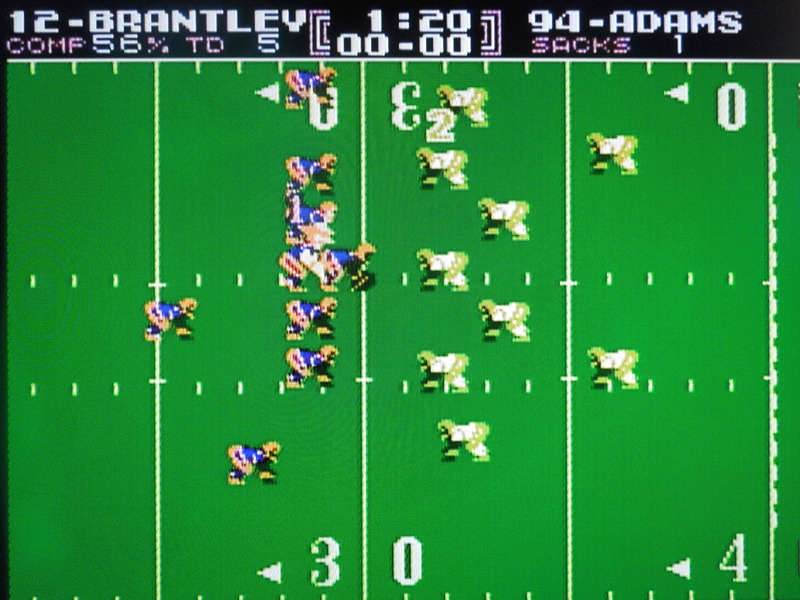 The game included 12 NFL teams and was a massive hit amongst NES gamers. 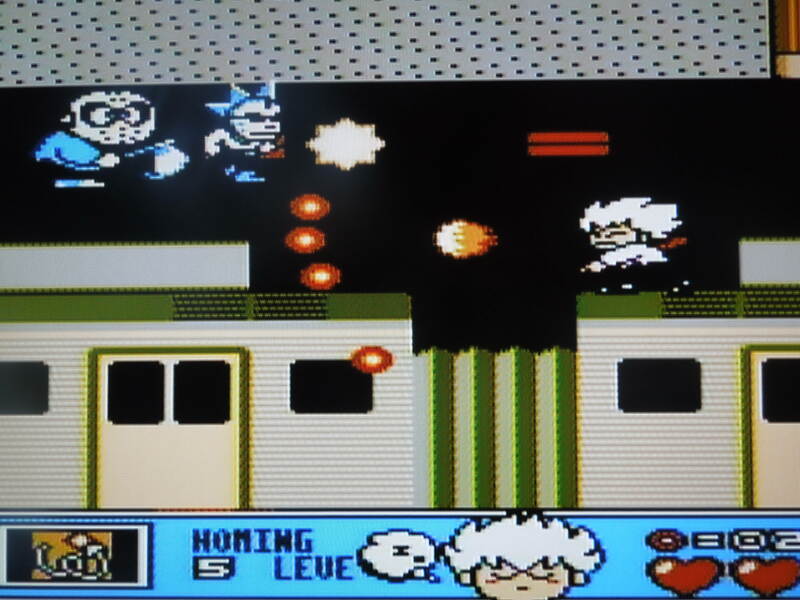 The game is still played today both on home consoles and on computer emulators. 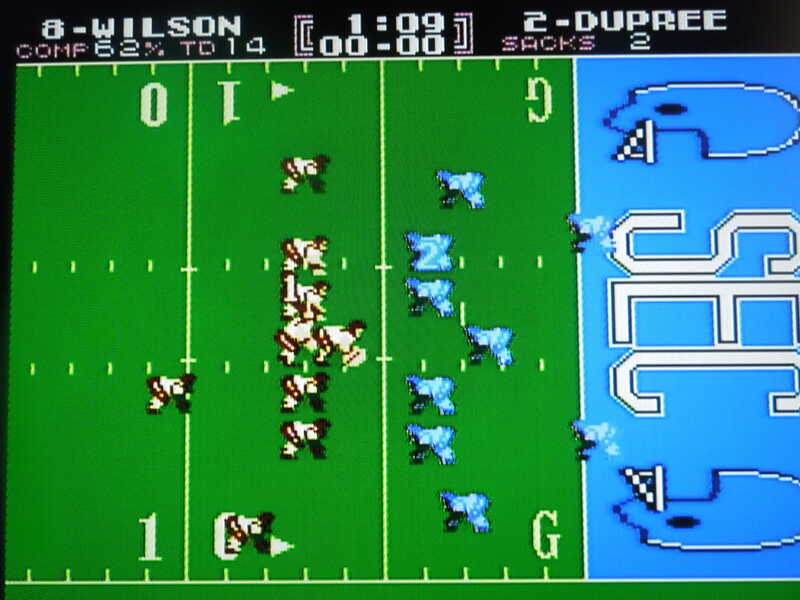 Because of the game’s popularity, modders have frequently updated or altogether changed the original Tecmo Bowl, altering things like teams, colors, player abilities, and playbooks. There are many different ‘versions’ of Tecmo Bowl available as online roms because of this, with some games being better than others, based on who did the modding. However, until now, the modifications have always been NFL teams. 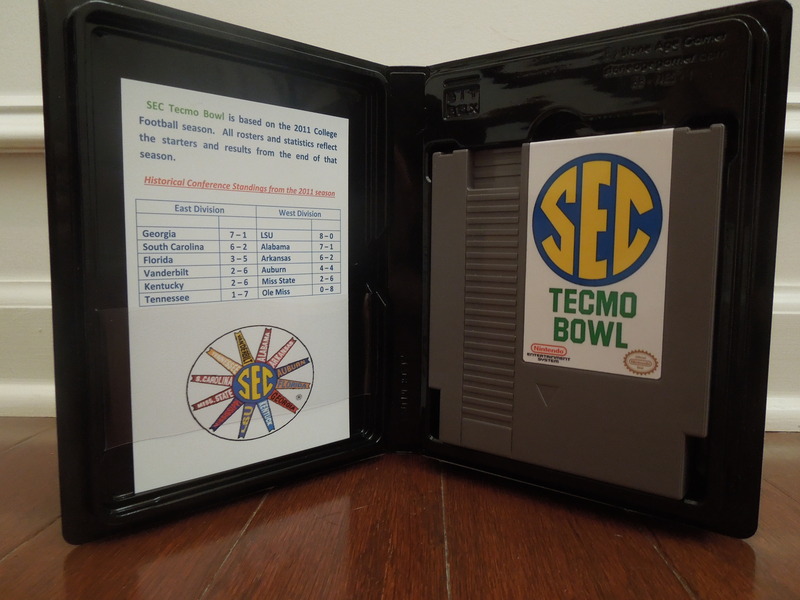 Finally, however, after 24 years, someone finally made a college version – SEC Tecmo Bowl! There are tons of people nationwide who hold College Football in higher esteem than the NFL (particularly in the southeastern U.S.), and this game is a dream come true for these college football fans! The Modder: Check out http://stevenvbrown.wordpress.com/mytbmod/ to read about the genius who made this game possible. It was an intricate process, and he did a great job and devoted a lot of time to this project – thanks Steven! Also thanks to ocd reproductions for getting Steven’s rom to work on an NES cartridge, Stone Age Gamer for the excellent game case, and the missus for her help with the inserts (helmet picture created by Steven Brown). 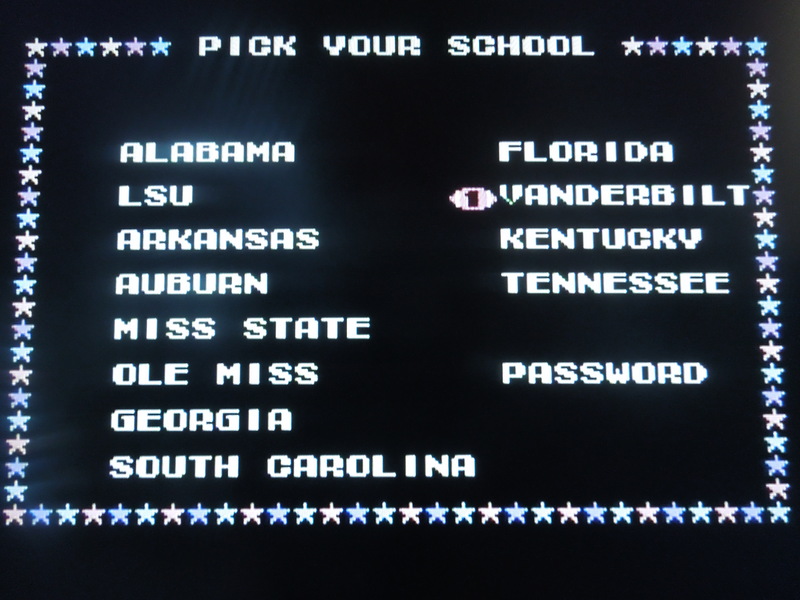 The Game: SEC Tecmo Bowl includes the twelve teams of the Southeastern Conference (before they expanded to 14 teams in 2012). Sorry, no Texas A & M or Missouri. Steven did a fantastic job of making the college teams look like their real-life counterparts. LSU is yellow and white, Florida is blue and orange, Kentucky is all blue, etc. The endzones also reflect the ‘color’ of each school playing in the game, and the endzones have ‘SEC’ written inside them – it looks great. The rosters reflect the 2011 college football season, and from what I can tell, it looks like everyone is in their correct position. Player ethnicities all appear to be correct, something the original Tecmo Bowl back in 1989 didn’t even get entirely accurate. The helmets that depict each school were also re-done, and they look incredible. 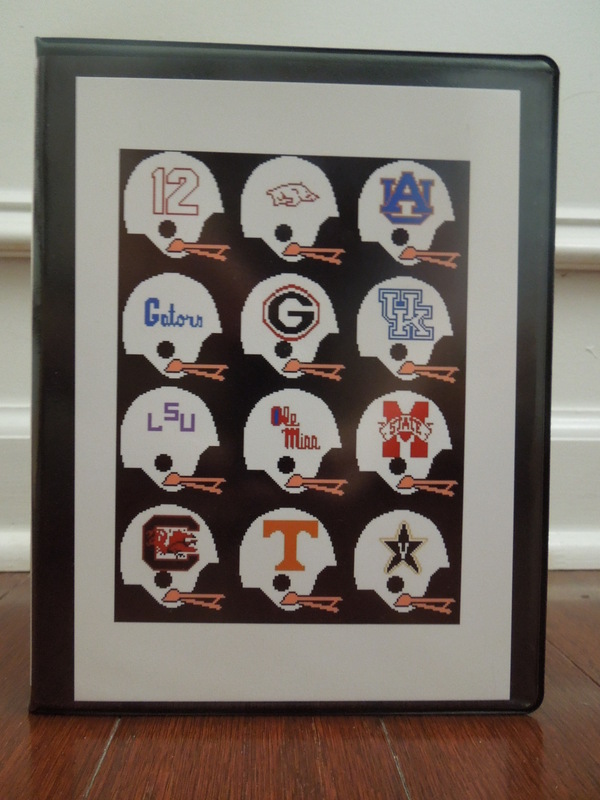 All 12 SEC teams (before the 2012 expansion) are included. The Players and Playbooks: Steven gave each team their own unique playbook (based on what was available in the original TB), with each one having a variation of pass/run plays. Each team only has 4 plays on offense, and in this version, many schools have 3 pass plays and only 1 run play. Tennessee has 3 run plays and only 1 pass play. Each team has players of varying power/speed, and this really helps each team to feel different (in addition to their playbooks). Steven really did his homework when creating the players’ strengths or weaknesses, basing the players’ abilities on real SEC conference-game statistics from the 2011 season. Some running backs are really, really, quick and some are average, for example. The Schools: I haven’t fully explored each team’s defense, but did a quick run-through of their offenses, and here’s my quick initial assessment (4 stars best, 1 star worst) of their offensive productivity. Sorry it’s not too detailed, just a ‘first impression’ of each team, really. Some teams are easier to beat than others. Difficulty: I have been out of practice for a while, but it feels like this game is more difficult than the original Tecmo Bowl. Playing through the season, by the time I got to Week 4 and Vandy came on the schedule, it took me 3 tries to beat them! If I didn’t pick the correct run play, Vandy’s running back took it to the house almost every time! A few other teams were like this, while still others I was able to dominate. However, I like the fact that the computer isn’t a total pushover. While playing against the CPU is fun, the best part of SEC Tecmo Bowl, like the original, is playing 2 players VS. So, where can I find this game? The rom can be put onto NES cartridges for play on your home console, or you can play the rom on your computer emulator. Most people prefer to play ‘old’ games on emulators, which works great, but I’m of the mind that nothing beats the hardware/home console experience, hence the reason I had the cartridge made. Remember to check out Steven Brown’s website (link above) to read more about the making of the game. Conclusion: Playing the original Tecmo Bowl over the years, I always thought it would be the perfect game if only the teams were colleges, not NFL teams. Well, so did Steven Brown, and thanks to his determination and hard work, that dream is now a reality. SEC Tecmo Bowl is the same Tecmo Bowl you’ve always known and loved, but now with teams from the best conference in college football. Everything looks, sounds, and works great. This game is perfect (true, I am biased due to my love of college football, but that doesn’t make my assessment any less true). Fans of other college conferences and individual teams are still encouraged to check out this game, and who knows, maybe one day we’ll see a ‘Pac 12 Tecmo Bowl’ or ‘Big 10 Tecmo Bowl’. Until then, it’s S-E-C! S-E-C! S-E-C! 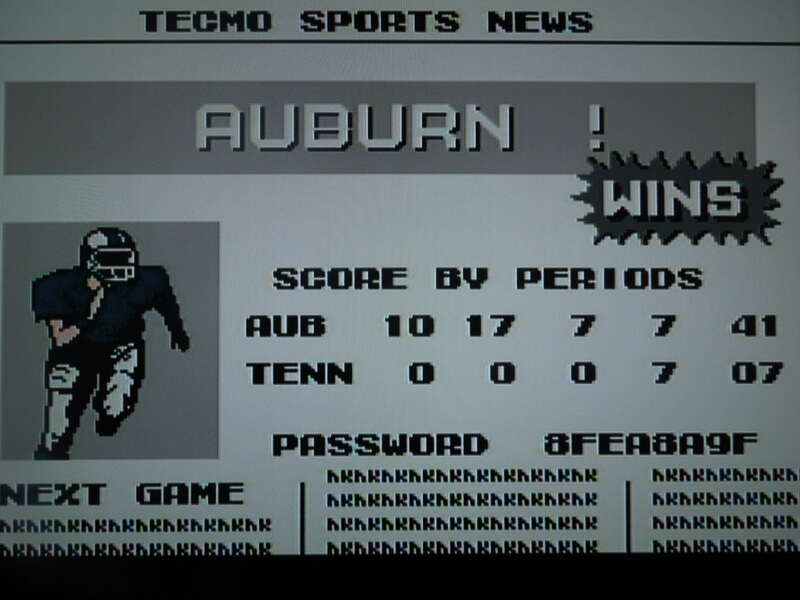 This entry was posted in NES - SEC Tecmo Bowl and tagged SEC Tecmo Bowl Review. Bookmark the permalink.